Rara Lake Trek: Rara Lake is Newly opened Trekking Trail in Nepal. A trek to Rara Lake is to get to a pristine off-the-beaten-track destination of Nepal. With majestic blue water that is draped by gorgeous hills on its sides, Rara is the largest and deepest freshwater lake in the Himalayas of Nepal. Rara Trek takes you through Rara National Park. This is the smallest national park in Nepal and The forest lights up with the signature red color of the rhododendron forests that are found plenty in this national park. The national park is also home to 240 species of birds and 51 species of mammals. This makes it a popular destination for bird watchers and animal lovers. Your Rara trek starts after a flight from Kathmandu to Nepalgunj and another connecting flight to Jumla. Rara lies in the remote parts of Nepal which give you a taste of the authentic rural lifestyle of Nepal. 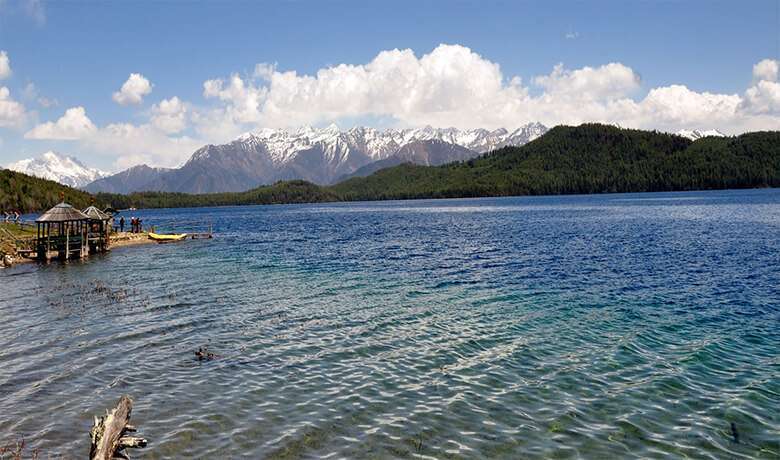 Rara lake lies at an altitude of 2990 meters. It has a depth of 167 meters and covers an area of 10.8 square kilometers. But during the trek, you will cross two mountain passes i.e. Danphe Lagna Pass and Ghurchi Lagna pass. They have altitudes of 3691 m 3480 m respectively. Rara lake trek is an unforgettable experience in the wilderness of the western part of Nepal. Trekking there is a sumptuous experience with views of the snow-capped mountains, wonderful lakes, and wonderful culture of this region. On this day you will prepare for your trek. You can talk to your guide to be assured that you have every item you will need for trekking. If you don’t have all the appropriate gear, you can buy it this day. After buying all the items you might need, you will head to several UNESCO World Heritage sites in Kathmandu viz. Durbar Square, Swayambhunath, Boudhanath, Pashupatinath Temple, Patan Durbar Square and Bhaktapur Durbar Square. You will spend your night in Kathmandu. After a a sightseeing trip in Kathmandu, you will take a 60 minute flight from Kathmandu to Nepalgunj. Nepalgunj is a sub-metropolitan city that is situated in Western Nepal. Nepalgunj is located quite close to the Nepal-India border in the south western part of Nepal. The town itself is a fascinating Terai town that houses people across various cultural background in Nepal. In Nepalgunj, ryou will visit the neighborhood showcase, smaller than normal zoo and close-by towns. After an early breakfast in a hotel in Nepalgunj, you will travel to the bumpy scene of Jumla, one of the minimum open areas in Nepal. Jumla is likewise the door for trekkers who come to explore the remote Karnali region of Nepal. Jumla also holds a special place in the Nepalese history in culture. Nepali language first originated in the Sinja Valley of Jumla district. At the time of its origin, Nepali language was known as “Khas Bhasa” as Sinja was the capital of Khas Kingdom. Today is the first day of your trek. You leave Jumla and rise to Chere Chaur along the Jugad Khola. Along the way, you will pass Khalanga Bazzar, a little commercial center for the close-by towns. You likewise pass a few towns, green forests, religious temples, and a sanctuary before getting to Chere Chaur. From Chere Chaur, you will take the western trail and climb gradually until you reach Jaljala pass (3580m). You will cross the pass and keep trekking on a moderately straight trail until you reach Jaljala Chaur. From here, you will climb on a precarious trail and enter the Rara Lake Circuit before finally arriving at Chalachaur. It is a tough move to Sinja Valley. In transit we go through a few towns and stroll along the Jaljala Khola (stream). Sinja Valley holds a place in the ancient history of Nepal. The valley houses the old capital city of the Khasa Kingdom that controlled this territory from the twelfth to the fourteenth century. Royal residences, sanctuaries, and the old stays of a settlement in this valley were revealed amid unearthings in a research that was led by the Department of Archeology at Cambridge University. and trek along an uphill to Ghorosingha. After having breakfast in Ghorosingha, you will start your trek to Rara Lake. Our trail is nearby Chuchhemara Danda, which is a wonderful location to view the Himalay, the gorgeous Rara Lake, and the lavish vegetation of the Rara National Park. The trail from Chuchhemara Danda will take you through Khatyar Khola Camp and a couple of towns including Murma. The uphill from Murma is moderate in nature. You will move ahead towards Chapri town, where the headquarter of Rara National Park lies. You will explore the biggest freshwater lake in Nepal- Rara Lake- this day. The lake is located at an altitude of 2290 meters. The turquoise blue waters of the huge lake likewise alluded to as Mahendra Taal (Lake) after late lord Mahendra. While boating in Rara Lake, you will get to admire the beautiful setting of the lake. You can also catch the sight of the many assortments of fish in this lake. Chuchemara Peak lies on the southern side of the Rara Lake while Ruma Kand and Malika Kand lies on the northern range. You will have your breakfast at Rara Lake and begin this day’s trek. You will trek on a relatively straight way until Gamgadhi. Gamgadhi is the central command of the remote Mugu District of Nepal. From Gamgadhi, you will trek to Pina Village, where we spend the night. On this day, you will descend from Pina and cross the Ghurchi Lagna pass at 3480 m. From Ghuruchi Lagna pass, you will cross various towns with beautiful mountain views before reaching Bumra. Bumra, which is also known as Nauri Ghat, is a quaint village. This days trek begins with with crossing of two suspension connects above Hima River and walk downhill. After trekking for a couple of hours, you will get to a hot spring. A bath at the hot spring will help you get relief from whatever aches and tiredness you might be experiencing during your trek. After trekking from the hot spring for some time, you will cross Danphe Lagna Pass. The pass is located at an altitude of 3691 m. From Chercheur, you will take the same trail you took on your way up from Jumla. Overnight in Jumla. From Jumla, you will take a flight to Nepalgunj. The total length of the flight is about 30 minutes. You can spend the rest of your day strolling around the market areas of Nepalgunj. You can also spend the day giving rest to your body after the stress of trekking. Next day, you will take a flight from Nepalgunj to Kathmandu. Whatever time you have in Kathmandu this day, you can do anything you wish for. This is the day when you bid goodbye to the beautiful country of Nepal. You also have the option of taking a tour around any other part of Nepal. We hope that the tour you took with us was satisfying and we could see you again in the future. All the chocolate, dessert, and sweet items. An Amazing Lake Rara ! I interacted with some Nepali trekkers on my trip to Annapurna Base Camp organized by Sublime Trails. When I asked them about the most gorgeous place they had been to in Nepal, they said that there was something majestic about their trip to Rara lake. So when I completed my ABC trek, I asked Sublime Trails to manage a trek to Rara. I just fell in love with Rara Lake. Surprisingly, there were not a lot of tourists from outside Nepal during my visit. It might have been due to the remote location of the place. But my stay was simply awesome. Despite its remote location, I had fantastic services arranged for me by Sublime Trails. If any of my friends look for some suggestion regarding the places to visit in Nepal, I’ll certainly tell them to go to Rara. And if they ask for a trekking agency, there is no one I would recommend them more than Sublime. You guys made my trip rocking.